Have you ever had cause to stop and look at your actions only to discover yourself locked in the subtle madness of passive-aggressive acting out towards someone you love? If you have, or worse have been in the unfortunate position of being on the receiving end, then Christopher Lovick’s new short, premiering on Directors Notes today, will speak to you on a deeply visceral level. The story of a man who whisks his girlfriend away on a make-or-break Airbnb getaway only to be confronted with a revelation which rocks his fragile ego, Brandon plunges us into the ugly depths of toxic masculinity wrought by illogical jealousy. I spoke to Christopher about working closely with his actors to craft this entertainingly painful dark comedy and why Brandon should act as a warning bell for the uglier sides of our personalities. Where did this tale of spiralling insecurity come from? It started as an idea for a character. My co-writer and lead actor Chad Faust and I both toil in themes of obsession and characters who dig their own graves. Over ramen in West LA, we came up with a character preoccupied with his girlfriend’s past lovers and started bouncing nightmare scenarios targeted at that affliction. We took off to my family’s cabin in Washington state and wrote the script in a couple of days between games of ping pong and croquet. After a couple rounds of development notes with Richard Kahan, and convincing Scottie Thompson to play Liza, we shot quickly and collaboratively for two days at a cabin in Sky Forest, a town in the mountains of San Bernardino. It’s refreshing to see that Scottie Thompson’s girlfriend character has an agency which makes her much more than a passive victim to his behaviour. We saw Scottie’s character as like a shaman guiding him through an ayahuasca trip. When she alludes to Brandon being her first, she is macro-dosing him. It’s a narcotic lie that activates his deepest nightmare. But she stays close, keeping an eye on him as he writhes in the nightmare. She joins him in the tub at the end because she loves him. She showed him the void but didn’t leave him there. A piece like this lives and dies on its acting and Chad and Scottie really brought their A-game. Their bravery and honesty in the bathtub at the end is up there on the screen. I also enjoyed how seemingly trivial incidents would further incite the destructive cycle of jealousy. We knew we wanted the triggers to be subtle. It was his reaction to those triggers we had to be careful about. At one point we had him peeing in Brandon’s closet and firing a shotgun into the ceiling, but were thankfully talked out of it, lucky to have perceptive friends to show early drafts/cuts to. They helped pare down the work and save us from ourselves. Brandon is about the battle we have with our worst self. What was your approach for shooting in such a distinctive location? The DP, Andrew Baris, and I wanted to lean into the wood tones and transition from warmth to cool as TJ descends. We both love the film Amour and our opening is a nod to its doorways and windows with characters drifting in and out of frame. We wanted the film to have lots of texture and grain so we shot on the Alexa Mini with Zeiss CP.2s at 1600 ISO. We did a lot of oners, so needed a nice and balanced far side key. For that, we used two Arri SkyPanels. An additional two LiteMats helped us add level to harder to reach places and fake a skylight in the bedroom. 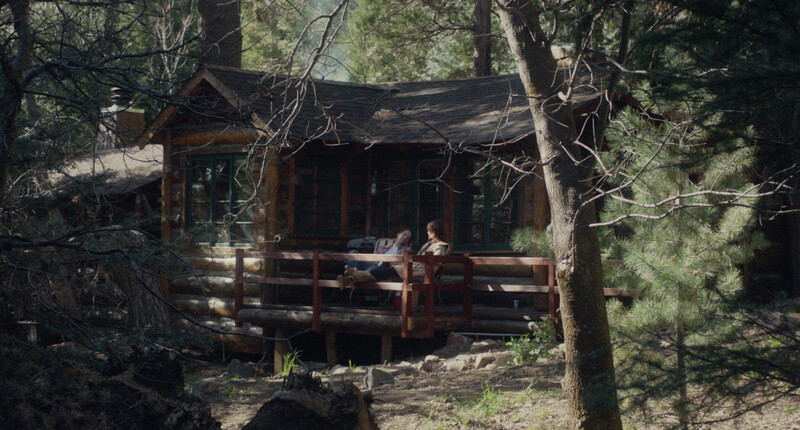 Fortunately, we needed very little set decoration, as Dan Volz’ cabin is a work of art. He built it himself and most of what you see in the film is his, including the cowboy and the panther. This is a film which moves easily between light and dark emotional tones, how did you navigate that balance? Post-production proved challenging. Whenever you have a black comedy with a hopeful ending, you’re going to have to work hard to dial in the tone. But we got lucky with our craftsmen. Jacob Kirby’s coloring added consistency to the grain and midnight tones. Edgar Maldonado’s mix helped bring out the comedy, while Greg Bevis’ score kept things tense yet hopeful. Do you feel there are any lessons here for the audience, particularly the insecure men out there? Ultimately Brandon is about the battle we have with our worst self. We all have a “Brandon”, a beast within who is the embodiment of our bad ideas and deep insecurities. They grow larger the more we ignore them and they love making their grand entrance when we’re the closest to happiness. So this film is a call to action to keep an eye on your particular Brandon… or you’ll end up in a bathtub with a jerry can. Brandon is one of the many great projects shared with the Directors Notes Programmers through our submissions process. If you’d like to join them submit your film.